Motorsport has joined forces with KONI to create an exciting new product, one of the most requested upgrades for early Z-Cars we've had, to replace (and improve upon) the long-departed Tokico HP & Illumina Adjustable Struts. Completely new, constructed specifically for 70-83 Datsun 240Z, 260Z, 280Z, & 280ZX, these externally-rebound-adjustable, twin-tube low pressure gas-charged KONI Sport (Yellow) Struts are designed for use on both stock & modified street cars, as well as autocross & track day cars. Built to give a good balance of street ride quality and handling at the softer end of the adjustment range, the KONI Sports can easily be tuned up to nearly double the rebound damping force for more aggressive control needs: simply open the hood or rear hatch and turn the KONI adjuster knob. Not only can you tailor the struts to your local road conditions (and to your taste), you can also quickly and easily change the settings for a blast at a weekend autocross or mountain run, then easily re-set them for a relaxed ride home. Whatever suspension behavior you need is literally at your fingertips. Also, if you race on different tracks and race conditions, the adjustable damping gives you an edge in setting up your car specifically for any track or autocross course. Koni believes they will work great with Eibach Springs, and will be fine with even lower springs, as long as a proper bump stop is used. Let us know if you have any questions, James@TheZStore & I will get you an answer. @Joseph@TheZStoreThis is awesome news. Have you guys installed in one or more cars and tested on street and track? If so, a write-up by drivers describing the characteristics and other setup elements (which springs, anti-roll bars, etc) would be really helpful. If not, any chance this is being considered? I went to MSA's website and they are testing now with results coming soon. https://www.thezstore.com/page/TZS/CTGY/classic20b04 Click on the "test pilot" page. Koni believes they will work great with Eibach Springs, and will be fine with even lower springs, as long as a proper bump stop is used. Let us know if you have any questions, James@TheZStore & I will get you an answer. You should post a link to the instructions so people know what's involved and how they work. Looks like some special bits involved. 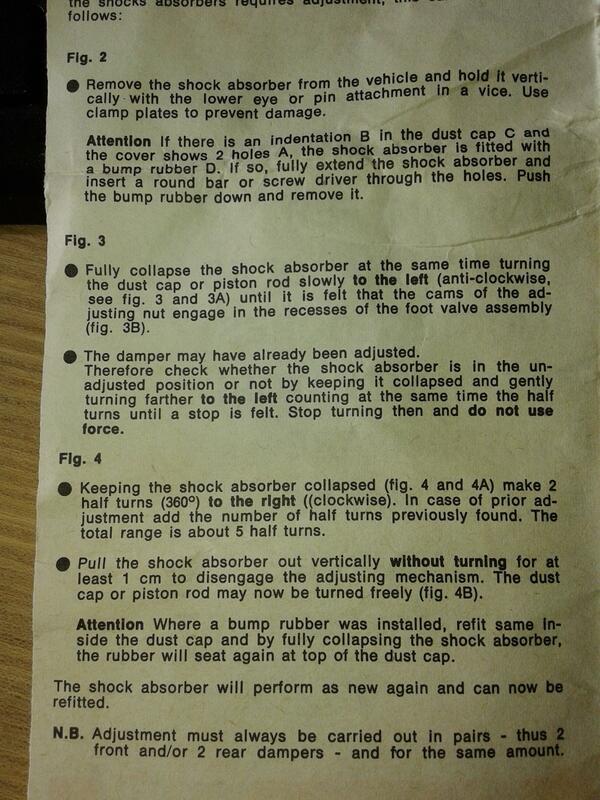 Also, are you selling the "proper" bump stops, or will people have to figure that part out on their own? I've seen where bump stops come with the Koni strut. They don't do that anymore? @James@TheZStore ..... ZH makes a great point. Koni makes great soft bump stops and it would be fantastic if you guys would sell the model or models that have an inner diameter that fits the shaft best. Hey! I recognize that front end. I didn't realize Hector had this car. Nice car. With respect to the chatter about the Konis, this is a great deal. IMO, there are shock absorbers and then there are Konis. As much as I appreciate the comments about Illuminas, they are NLA so that means that there is no comparison. But that pretty much is how I feel about Konis, and these are the adjustable version. As much as I appreciate the comments about Illuminas, they are NLA so that means that there is no comparison. That's the "take it or leave it" approach. Give a good comparison and you'll get more "take it"s than "leave it"s. Without a comparison, KYB's are a known quantity, the Koni's an unknown quantity. 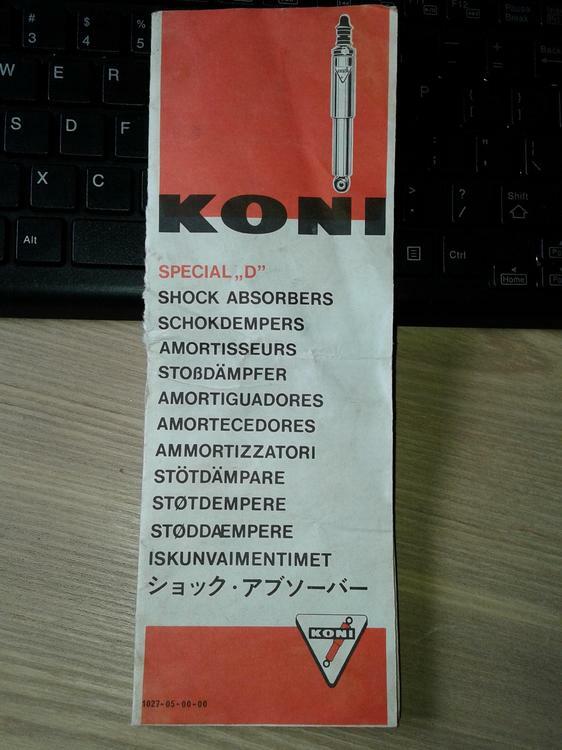 In today's world it's very possible that these "new" Koni's are just rebranded "other" shocks. It's the world we live in. Koni could just be a trademark. Today's world is littered with old well-known brand names on low quality parts. The more info supplied the more likely people will make the jump. Please don't reply with "I can assure you". Just data, it's all that matters. Good luck. They look promising. I'm all over this, thanks for posting. Externally adjustable front and rear too, that's awesome. Subscribed. As far as these being genuine Koni creations, I can say that about a year ago, Greg started digging through all our suspension parts to find proper strut housings and so forth to ship off to them for the engineers. A year and lots of work later, these are the result, and they were 100% designed and created by Koni to their Sport Yellow spec of struts. Here is the official Koni release: http://www.koni-na.com/en-US/NorthAmerica/News/News-Releases/KONI-Sport-Performance-Dampers-for-Classic-’70-83/. Don't be surprised if Lee from Koni himself jumps in here at some point. Koni has been absolutely awesome through this process, I think we're all lucky to have Koni wanting to invest in Classic Z's. As far as the bump stops, by "proper" they basically meant having properly designed and undamaged units, trimmed if needed based on spring height. These units do not come with bump stops. The factory rubber ones are acceptable, and our urethane ones might be the best bet for progressive "bottoming", in addition to the fact that they fit the shaft sleeve diameter perfectly. As far as the Koni "Silastic" Foam Rubber (i.e. Silicone) bump stops, they look like a great progressive option as well. They are not model specific, and may not fit as snugly as our urethane ones (we're going to get some and try, and let you know), but we're looking into offering those as well. Assuming the Amazon seller has the right part pictured, you can see one of those ($26.56 each? Ouch!) here: https://www.amazon.com/Koni-70-34-54-000-0-Bump-Stop/dp/B001G99RKS. As far as the hardware shown above, the top left is the shaft sleeve. The sleeve fit is perfect. I'll try to find a spring seat if possible and show some of it fit together. Below that in the image of course is the top locking nut. On the bottom left of the image is the I-realize-now-I-should-have-exposed-that-in-the-image-better Gland Nut. I'm looking for inexpensive options for tools so you don't have to use a pipe wrench. Will advise. On the bottom right is their "washer" to go on top of the Gland Nut. It is designed with channels and waves, the purpose being an added layer of protection for the seal underneath, as it will direct away any air pressure when bottoming, or road junk that bounces up there, so it doesn't end up crammed on top of the seal. I'll check with Hector on Illumina's. It won't surprise me if he has experience with them and can offer some comparisons. Stay tuned. James will be following up if we missed anything. Thanks for the interest! I'm surprised that you don't "know" about Konis. 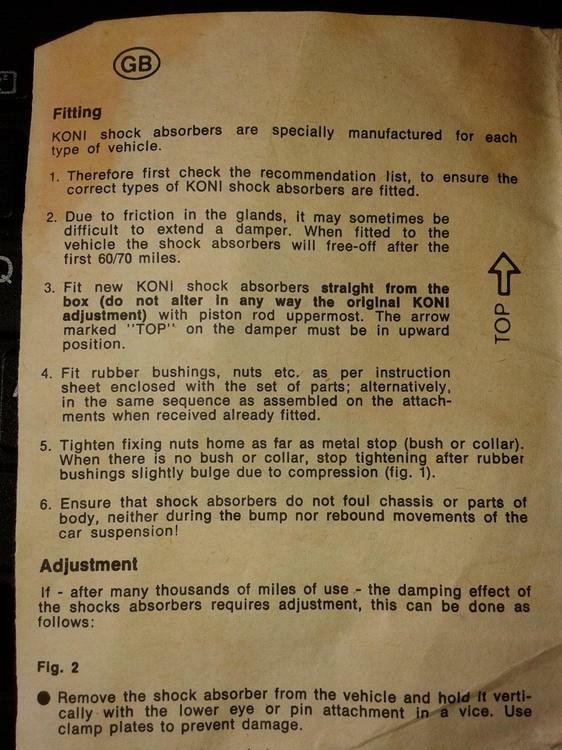 I suppose that if you knew anything about the Koni brand, you wouldn't write what you did. Good luck. I have a set of red spec; internal valve adjustment, which is a little more of a pain-in-the-arse than the yellow spec series we are discussing. The yellow spec series allows for valve adjustment while they are installed. I'm surprised that you don't "know" about Konis. I suppose that if you knew anything about the Koni brand, you wouldn't write what you did. I do know about Koni's. I had a pair on my dirt bike. Waaaaaaayyyy back when. I'm just not living in the past. Much has changed since then. Joseph gave a great answer. Hello all, my name is Lee Grimes and I am the Automotive Product Manager for KONI Shocks. I have been working with Greg and Joseph to get these new Z-car parts to market and help answer some questions. He pointed me to this discussion to maybe give some clarity or assistance. I won't be able to stay as a regular contributor but I will be happy to check in for a little bit to help people understand the new parts. A bit over a year ago, Motorsport Auto came to KONI to see if we could revive and modernize our offering for the early 240Z, 260Z, 280Z and 280ZX. Needless to say we jumped at the chance to offer proper products for these important cars. Off and on through the years KONI has offered the tradtional red painted KONI Special strut inserts with internal (off the car) adjustment for 240Z through 280ZX. In the late '70s-and early '80s KONI also offered an externally adjustable version for these cars excluding the ZX but they were discontinued by the mid-'80s. Now was time for an update. With Motorsport Auto as an exclusive partner stepping up to take full production run volume, we developed and tested new externally rebound adjustable (knob adjustable on the car) yellow painted KONI Sport strut inserts for these cars and a externally adjustable rear shock for the ZX. We started with the external adjustables from the 1980s as the launching point and even used the same part numbers this time with the SPORT suffix in the part numbers. We then updated the internals a bit (it was no slouch to begin with back then though) to more modern seals and guide components and set the valving to work well with either factory stock springs (starting baseline adjustment at or near full soft) or performance lowering springs for perforamnce street, autocross, track day, etc. use (starting baseline adjustment about 1/2-3/4 turn up from full soft setting). Like all KONIs, the adjustment range is about 100% so they are twice as firm at the maximum setting than at the minimum setting. This is a very large range of adjustment so we suggest that you start in the lower end of the range, drive it for a bit to get a feeling for it, and then tune accordingly from there for your ride and handling preference. I think it will be very rare that people will use more than 1 turn (about 50% higher than full soft) for normal use when they are new. Because the adjustment range is so large, it allows you to compensate for wear over extended time, tune it high for an autocross or track day, and then quickly turn it back down for street use. Because the range is so large, it is possible to overdamp the car for your needs and actually make it more harsh and have less grip than needed so do not just turn it way up figuring that "more is always better". Although these could be used for a dedicated track and racing car, their needs and expectations are different and we do have other racing options (e.g. 8610 RACE and 8611 RACE) where street handling and ride quality, high mileage longevity, etc. are no longer important. These new Z-car Sports are targetted to take you from stock Z- car to just shy of all out racing. They carry KONI's limited lifetime warranty against defects and materials to the original purchaser as long as tht person owns the car registerd for street use. Regarding the discussion about bump rubbers, you can use a good condition OE type bump rubber for a Z-car, one of the black urethane ones that Motorsport Auto sells, or the KONI Racing Silastic bump tops made for use on a 22mm piston rod. KONI does not have a specific bump stop length suggestions as different ride heights and springs will determine what length you need. The imporant part is that you have some bump rubber installed to keep the strut or shock from bottoming out internally which can cause internal damage that will cause loss of function and will not be covered under warranty. The first production runs of the fronts and rears for the 240Z, 260Z, and 280Z are currently in-transit from KONI in The Netherlands due in mid-March. 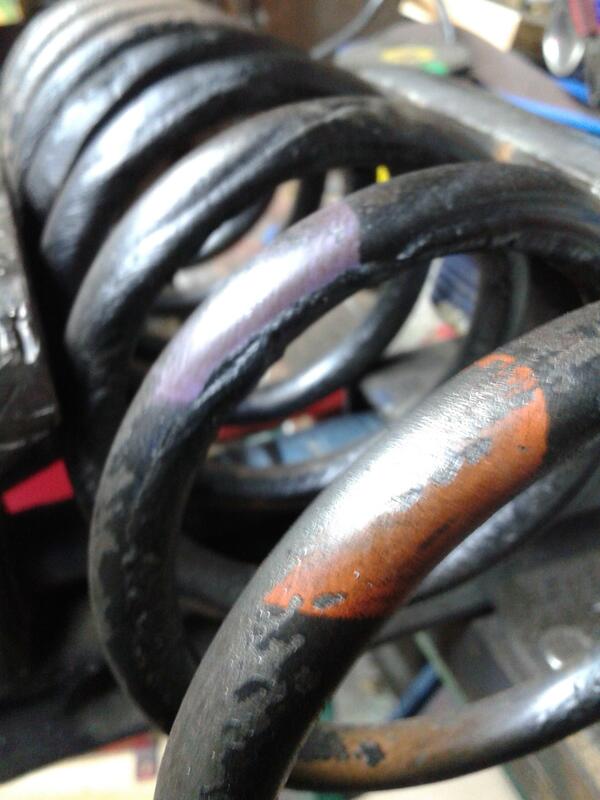 The 280ZX fronts are in-transit as well but the 280ZX rear shocks are awaiting final production due to to different compponent sourcing but will be here ASAP. Please be clear that these were specifically developed only for these Z-car applications and they are not crossovers from ome other vehicle. Because these parts are exclusive to Motorsport Auto and no other KONI dealer has access to them, we will not be listing these part numbers on our official KONI websites for North America www.koni-na.com or Europe www.koni.com. If you have any questions, pelase contact our Technical Staff at info@koni-na.com or 859-586-4100 Option 6 from M-F 8-5 Eastern time. Thanks, KONI Lee, for adding some color to the discussion, I am definitely ordering a set for my 240Z. Yup, KONI has always been a Dutch company, founded in 1857 as a horse saddlery in the little town of Oud Beijerland, about an hour south of Amsterdam. The main factory/world HQ is still located in the same town about about a mile or so away from the original saddlery, which is now a museum. There is a 3 or 4 digit manufacturing date code stamped into those old KONIs right near the part number. If you are interested and want to get me that number, I can tell you how old they are. There were major technology updates (mostly friction reduction and longevity extending) to the pistons, seals and top guide bushings in the early to mid-'80s so yours could be from before or after then. It would almost certainly be possible to service your old ones however done individually the labor cost with parts would probably be higher than buying brand new ones that have all new parts, the full warranty, and features. 3 or 4 digit manufacturing date code stamped into those old KONIs right near the part number. Yes, the 82R-1811 have 705 and the 82R-1812 have 007 stamped into it under the partnumber! It says also "special D" on it and have all 4 of them lots of patent numbers for different country's on them. I'm curious what the real dates are! so thanks in advance! Also a pic from the spring of my 280zx.. it has 2 spots on it, orange and purple.. i guess it's a way to mark how strong they are? You were told the correct era for those particular parts. The 82R prefix tells us they are early strut inserts used before KONI made many major part number and component updates in the 1982-1984-ish era. Early on, 82 could mean shock, full strut, or strut insert. After the changes, all strut inserts were called 86, full struts were called 87 and 50-55mm OD body shocks stayed as 82s. The alphabet letter was dropped at that time too. So the red Z-car inserts after the mid 1980s would have been called 86-1811 and 86 1812. There were many internal upgrades during this time period as I alluded to above. The only externally visible major difference is the piston rod guide and seal assembly where the chrome rod goes into the body. The old style like yours will have a couple concentric rings visible on the end of the insert and usually a couple tool slots in them that created pressure on the old seal system of stacked felt and rubber rings. The newer design used since the mid-80s is flatter and has fewer concentric rings and a longer lasting, better sealing Viton oil seal in addition to newer bronze guides with Teflon and other low friction coatings to reduce friction and wear long term. So your 82R-1811 705 would be from 1977 Week 05 or early February production. Your 82R 1812 007 would be from 1980 Week 07 or late February production. Both will have the older guide and seal system and may not last the longest now 40 years later and not have the low friction updates. The Special D was a product designation for all red painted KONIs, the main color KONI used until they diversified in the 1980s to include yellow paint (KONI Sport) and much later black (KONI Classic), bright orange (KONI STR.T), and gold (KONI FSD). The red is also now used on other truck and car product lines are well. I have no info on your spring pic because it has no KONI connection. They could be either OE or some aftermarket springs but they are not a KONI spring that I have heard reference to in my 20+ years here. KONI has dabbled off and on over the decades with selling damper & spring combo packages, more in the USA than in Europe. @KONI Lee ..... thank you for engaging in some Q&A. If you don't mind, and since we are on the topic, can you comment on the red Koni Classic strut inserts produced during the past 4-5 years for the 240z? Were they the same as or an improvement on or totally different from the 80s era 1811 and 1812 strut inserts? I have them on one car and like them very much. They adjust just like the 70s and 80s strut inserts. @KONI Lee....Also...one question from me regarding the new Koni / MSA Yellow offering. Some of us have noticed that when installing gas charged strut inserts on our cars, compared to non-gas charged like the Koni Classic, the ride height rises an inch or so. Do you think this will be the case with the Koni Yellows? Specifically if you compare Koni reds with the new Koni yellows on the same car with the same springs, would the yellows cause a higher ride height? The red KONI Classics that have been made in the last roughly 20ish years are the much younger siblings of the very old set that I discussed just above. Their part numbers will be 86 1811 and 86 1812 (for 240Z/260Z) and have the modern seals and low friction guides and pistons and 86 strut insert part number prefix that I discussed. These were out of production for many years but it was revived in the mid '90s when the car saw a popularity rise including Nissan's official revival/rebuild program on some early cars. They have stayed in low volume, limited availability since then. They are the internally adjustable (compress-to-adjust off the car) version so they are not as friendly to adjust for general tuning, going back and forth for street, autocross, & track day use, wear compensation, etc. Their valving is a bit softer (but certainly not a "soft" damper) than the new Sports that we have just developed with Motorsport Auto. These were of twin-tube hydraulic (non-gas charged) design so they won't self-extend if you compress them off the car but that has no relation to actual damper function on the car.